Fit for your home and office. Aarsun Woods brings to you a Traditional / customary Wooden temple / Pooja room made in premium quality Sheesham wood. The unit is handcrafted by the skilled artisan with smooth and fine finishing. there is beautiful single dome at the top of the temple in which holy word “OM” is carved along with its four finials.Below that there is main place for the deity where you can place your idols and worship them.There is fine wooden jaali is carved at the back and sides of the Jaali which help to cover up your temple.afterward there is beautiful drawer area where you can place your puja essentials like rosewater,incense sticks , cotton etc.This beautiful temple will give more divine look to your pooja ghar. The top part consists of fantastically engraved dome with floral design and holy word “OM” placed in front. At the top of the dome, main shikhar / bails are placed larger than the other four bails / shikhar at the corners of the top portions of the wooden temple. The lighting provision is also provided in Pooja room. The center also known as Grabgriha, is enclosed on all three sides in a jaali pattern. Also, in front top, hand-carved Mehraab is placed with the matching pattern. The main place where the idols are to be placed made of teak ply wood. The base there are 3 drawers and cabinet for miscellaneous things like incense sticks, camphor,lampoil,rosewater,etc. especially made for holy books,or other accessories related to deity and all other pooja essentials. Rosewood is perfect for making unique furniture for home and restaurant as it gives a very still finish to the product. The product is made up of Rosewood that gives natural look and delicious touch to your home and office. Please note that the base the ceiling and the inner portions of the Temple are made of Teak Ply to stabilize the whole structure of the product. 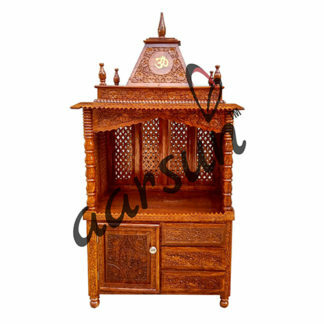 A wide range of Wooden Temple designs are available in Sheesham Wood Temple , also at Aarsun Woods Sheesham Wooden Temple Dark Walnut.